Dr. D.M.Mulki was a well-known M.B.B.S. doctor. Though originally belonging to Mumbai, due to his employment in the Govt. Medical Services, he got transferred from place to place and thus spent major years of his career outside Mumbai. His elder brother stayed in Mumbai. In 1915, the elder brother's elder son passed B.A. in first class. Hence, the faimly was very happy. However, its joy was short lived as the 18 year old boy embraced Christianity. In those days, conversion to another religion was considered to be a great defiance of society. The family, which was dreaming a bright future for its 18 year old, got suddenly thrown in a deep gorge. The person who got jolted most was the doctor's elder brother! His mental status collapsed totally. He was close to Kakasaheb Dixit. He took him to Shirdi. With Baba's blessings, he soon recovered mentally. His elder son had changed religion while his younger son contacted a dangerous disease known in Marathi as Hadyavran. Lot of medicines were given. Even expert doctors operated on the affected leg. Medicines were brought even from other countries. However, the pains were not going away. The family even resorted to visiting various deities and taking different vows. However, everything was turning out to be futile. Around that time, Shri Sai Baba's name was gaining popularity in Mumbai. "He is an Aulia. Even with His mere Darshan, devotees get cured of their ailments. With His Udi, even the most difficult diseases vanish" was the talk going around. Therefore, as a last effort, the father and mother took their both sons to Shirdi. The couple prostrated before Baba andnarrated their woes about the disease. They made a fervent appeal, "Babab we are unable to see the sufferings of our son. After trying out different remedies, we are at our wit's end. Hearing your fame, we have come as a last resort to You. Please place Your Hand on his head, bless him and give him the gift of his life." Hearing these words, Baba said, "those who come to the refuge of this Masjid, their bad times will always vanish. Anyone who steps into this Dwarkamai, the ship of his life will always rach the other coast. Keep this in mind and forget all worries now!" Baba made the boy sit in front of Him. He blessed him with His eyes and moved His hands - smered with Udi - over his back. He placed some Udi in the boy's mouth. The moment the Amrit entered his mouth, the boy's pains subsided. The family continued their stay in Shirdi over the next four days. They left Shirdi with their minds full of joy. Curing a difficult disease like Hadyavran was no small miracle ! In 1916, Dr. Mulk's servie got transferred to Govt. owned Halfkin Institute at Parel, Mumbai. On arriving in Mumbai, he visited his elder brother's family. The talk naturally turned towards the disease and its miraculous cure. 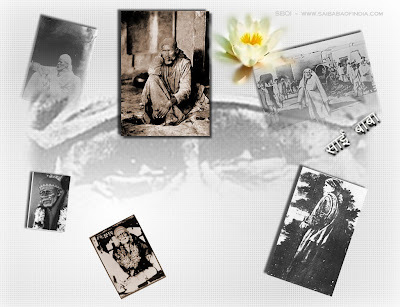 The family narrated the miracle in details and praised Shri Sai Baba whole heartedly. Here the doctor came to know about Sai Baba for the first time. He had not even seen His photograph till that time. In October of the same year, the doctor started suffering from fever. The temperature continously hovered around 105 to 106 degrees. The medical fraternity was trying its best. Due to their knowledge in these matters, the octors were not willing to resort to blind faith like Guru and miracles. However, now it was the Guru who had a keen desire to meet Dr. Mulki. One Thursday, Bhajans were being sung at the brother's house. That day doctor was running 104 degrees temperature. He was dozing. In his dream he saw an old Fakir Who had tied a cloth around His head. He said, "Dont worry. If you come at once for my darshan, your fever will go away". Doctor got scared with this strange dream and awoke. His sister-in-law came running. After doctor narrated his dream, from a cupboard she took out a photo wrapped in a silk cloth. Doctor confirmed that the same Fakir had appeared in his dream. He decided to immediately go to Shirdi and his fever vanished. But, after getting well, he gave priority to his office work. He postponed his trip to Shirdi and immediately resumed his duties at the office. After getting engrossed inw ork, as the days passed, he even forgot about the dream. In 1917, Baba once again reminded him about the dream. He was trying to get himself transferred outside Mumbai. Ultimately he was posted to Malegaon, which is closer to Shirdi. The Mumbai - Malegaon route passes through Manmad. If the doctor had so desired, he could have got down at Manmad and visited Shirdi vai Kopargaon. However, once again he gave priority to resuming his official duties at Malegaon over his pending pilgrimage visit to Shirdi. The doctor was not giving priority to visiting Shirdi; but Sai Baba remembered him well. He performed one more miracle. The doctor was attending to a pregnant lady who was delivering a baby. While deliverying in the new born child, some liquid got sprayed into his eye. There was a strong burning sensation and the eye got swollen. The civil surgeon feared that he may lose his eye. For the first time in his life, the doctor made a impassioned prayer to Sai Baba. His prayers were answered and within a week his eye recovered. Now he made a firm resolve to go to Shirdi. he asked his wife 9who was staying in Mumabi with his elder brother's family) to come to Malegaon and join him in the pilgrimage. He planned to that the couple will avail Baba's darshan at Shirdi and then go to Mumbai. They were waiting in Manmad for the train to take them to Kopargaon. It so happened that there was still some time for the departure of the train. The doctor therefore took a stroll on the paltform. He stated chit-chatting with a ticket collector and casually mentioned to him of his plans to visit Shirdi. The T.C. started talking adversely about Sai Baba and even cast aspersions about Sai Baba's moral character. Dr. Mulki got carried away by his talk, dropped his plans of visiting Shirdi and took a decision to return to Mumbai. Dr. Mulki later on wrote :- "We listened to the T.C. and at once decided to return to Mumbai. Even now I feel ashamed of my this unforgivable misdeed". However, the Sadguru always forgives the misdeeds of His children. Because of His greatness, our lives become worth living. After the couple returned to Mumbai, his siter-in-law once again persuaded him to visit Shirdi. They resolved to overcome all obstacles and utimately arrived in Shirdi. They took Darshan of Shri Sai Baba. Baba exactly narrated to the couple the incident tht had taken place a month back at Manmad station. The couple was amazed and moved to tears. They stayed in Shirdi for four days. Before embarking on their return journey to Mumbai, they sought permission of Baba. he said, "Now, start reciting Dnyaneshwari ! When you return to Mumbai, you will find on your table the telegram stating that you have been transferred to Vijapur". And, when the doctor arrived in Mumbai, he fouond that the telegram had really arrived. After 15 days, he resumed duties at Vijapur. From there he went as an honorary doctor to serve the army which was at war. From there, he came to Gadag and settled down there. He was so blessed by Baba that, even without knowing Marathi, every year he began reading Dnyaneshwari for a week.